Are your children learning English? If so, that is great! Kids can learn a language so much easier than adults. As with any learner, the more they are exposed to English, the better. This post will go over 3 simple, yet effective ways, that you can help your child learn English. What is your child’s favorite cartoon? Have you looked for it in English on YouTube? I bet you will find it! Kids get really excited when they see their favorite cartoon character speaking English. They will think, “Wait! Peppa Pig is Chinese like me… how can she speak English too! ?” You can play into this as much as you like. Tell your child that Peppa learned English because all of the cool pigs are doing it! On YouTube you can find full episodes as well as just short clips. Start small. If your child is a beginner, ease them into it with very simple clips designed for young children. Put it on in the background, just so that they can hear the language around them. YouTube can also be used to introduce grammar and vocabulary to your children. 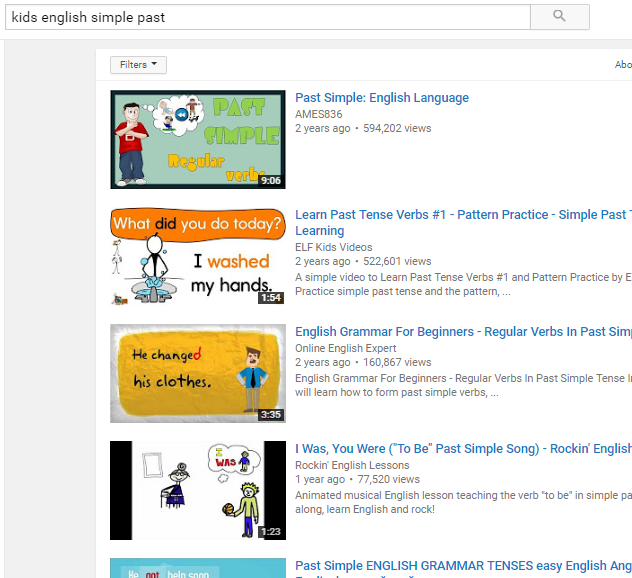 I searched ‘Kids English Simple Past’ and it came up with 78,300 results! Whether we like it or not, kids these days are all about the tablets, phones and computers. Why not introduce some fun interactive English sites into the mix? British Council has great sites for ESL (English as a second language) learners dedicated to kids and teens. I also recommend sites that native English speaking kids use as well. I can not stress the importance of INTERACTIVE learning enough. It is great for a kid to listen to videos in English, but playing educational games and doing interactive quizzes is the best thing for them. When the kids are actually USING the language and producing it, that is when they are progressing. Show your kids that YOU enjoy using English. I’ve done many sessions with kids of various ages over the years and the parent’s interaction and positive attitude towards English really shows in the child’s progress. Kids may not understand WHY they have to learn another language. They view it as just another course in school, or even worse– a course they have to do AFTER school! Make it fun for them and show them that you think it is fun as well. Sing songs, play games, talk in funny voices… whatever! Often when I am doing sessions with adults who have children, a child will wander into the room and is very curious about who the person on the screen is that is ‘talking funny’ to mommy or daddy. It’s great to include them in the sessions, have them say hello or whatever they can, just to get the experience. It’s all about the experiences they have with English at an early age that will shape their future ‘Learning English’ path. Make it positive, fun, and the results will astound you.